Events, application traces and infrastructure metrics from Pivotal Cloud Foundry (PCF) applications are all easily monitored within Datadog’s platform to help teams quickly understand and communicate about the performance of their stack. By connecting teams to every level of their PCF architecture, Datadog enables more effective development and management of PCF architectures. Catch problems earlier in the development process by seeing the impact of every code change on any aspect of the infrastructure within a single platform. Uncover performance issues with machine-learning-based alerting, and overlay events on top of infrastructure and application metrics to understand the context behind them. Improve communication across teams with accessible, publicly shareable dashboards, in-app annotations, and integrations with popular chat and ticketing software like Slack and PagerDuty. Datadog is a monitoring service for hybrid cloud applications, assisting organizations in improving agility, increasing efficiency, and providing end-to-end visibility across the application and organization. These capabilities are provided on a SaaS-based data analytics platform that enables Dev, Ops and other teams to accelerate go-to-market efforts, ensure application uptime, and successfully complete digital transformation initiatives. 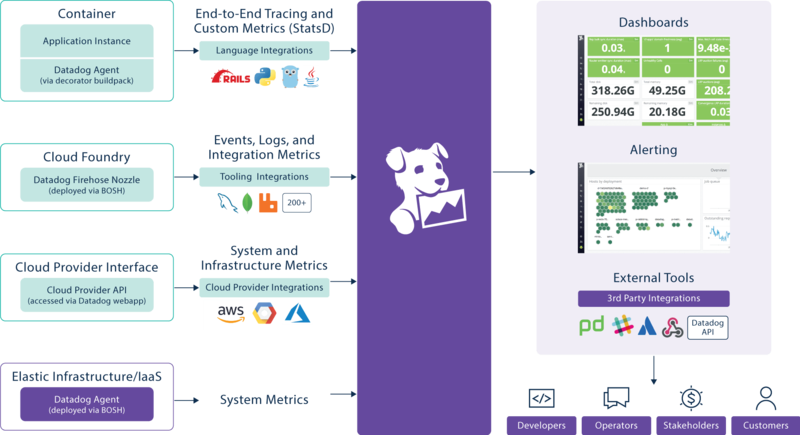 Since launching in 2010, Datadog has been adopted by more than 6000 enterprises including companies like Asana, eBay, PagerDuty, Stripe, Samsung, Target, The Washington Post, and Zendesk. Automatically adds software to virtual machines managed by BOSH. Eliminates need for associated custom manifests. "Datadog provides transparency into the PaaS engine room driving the applications. We enable Pivotal Cloud Foundry operators to see in real time when application or platform performance is degrading so they can take action before those problems affect customers." The Datadog Agent can be installed on nodes to collect system-level information, and can be deployed with the Datadog Agent BOSH release. Once uploaded to the BOSH Director, the Director can then install the agent on every node as an addon. Once the agent is installed on a node, it will begin reporting system-level metrics (CPU, memory, disk, network, etc.) for that node to Datadog. The Datadog Firehose Nozzle is used to capture metrics, event data, and logs from the PCF Firehose. Datadog provides a BOSH release of the Datadog Firehose Nozzle. After uploading the release to a BOSH Director, the Nozzle can be added to an existing Cloud Foundry deployment that has a working Loggregator Firehose. The Datadog decorator buildback enables custom metrics and end-to-end tracing for applications running on PCF. The decorator buildpack will install a limited version of the Datadog agent in the containers used to run applications, including just DogStatsD (a StatsD handler) and the APM functionality of the standard Datadog agent. From here, the agent will begin collecting traces and custom metrics from applications which have been instrumented appropriately, and the agent will forward that data to Datadog.